Mostly, I think we associate the pleasures and rewards of travel with discovering new places; of doing new things and experiencing different cultures. But there are also pleasures - different pleasures - to be gained from spending time in places you've visited before and already know well. Sometimes the pleasure comes from doing things you've done before and that you know you will enjoy. You plan these things and anticipate the delight they'll bring. Shopping at Silahis in the old part of Manila - Intramuros - is always on my list of things to do. 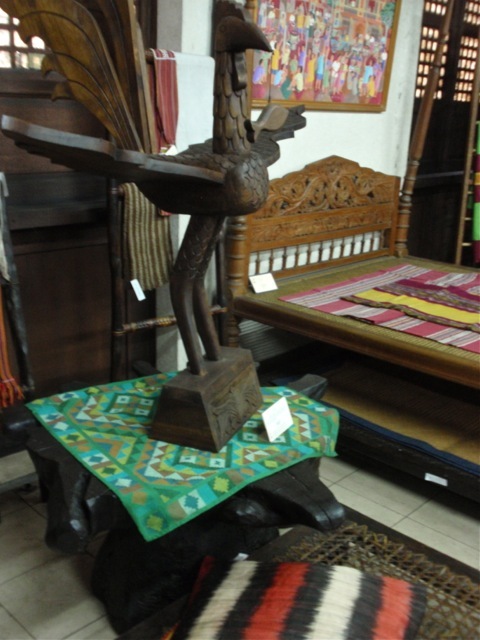 I've posted before about this four-storied treasure house of Filipino arts and crafts, and of my fears each time I visit that the Filipino crafts I value will no longer be available. But so far Silahis continues to provide many pleasures. I'd love to buy some of the big, intricately woven baskets they sell, but the thought of trying to get them home on the plane, and the reaction of Australian quarantine once I arrive is enough to deter me. So I bought textiles - as always. 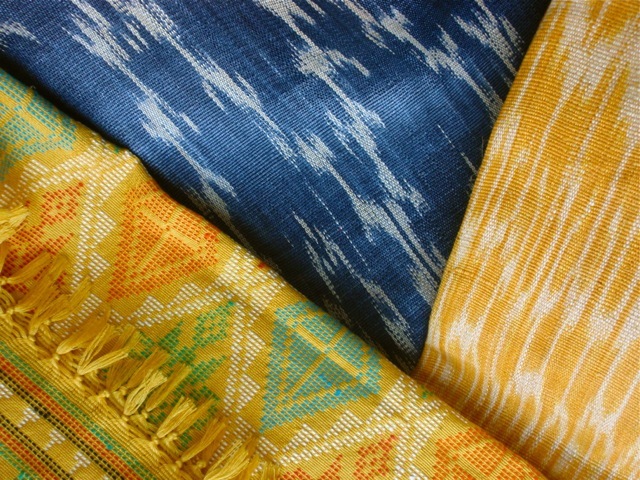 I bought a yellow hand-woven Yakan cloth from the southern Philippines that I'll use for a table runner and some yellow and indigo abaca cushion covers. 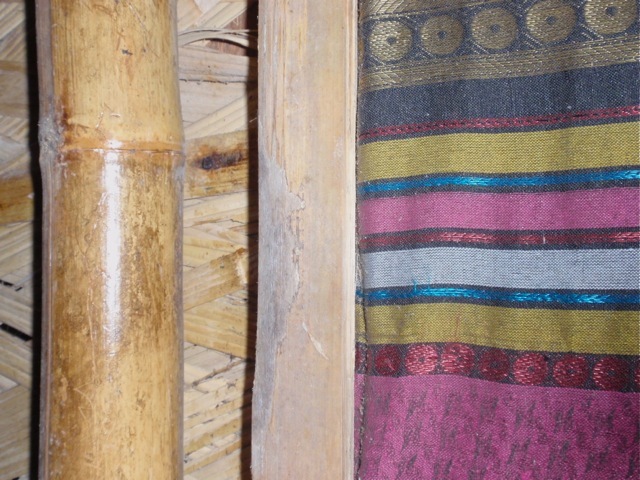 Abaca is traditionally woven by the T'boli people of central Mindanao using intricate ikat warp-dyed weaving techniques and naturally-dyed fibres. 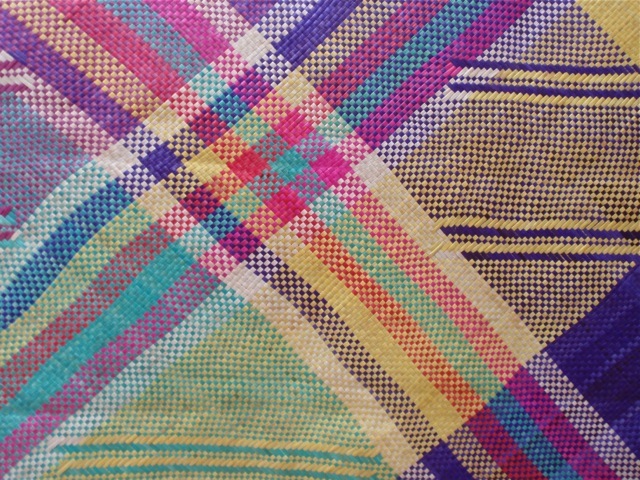 My cushion covers are less intricate and use modern dyes but still enable the weavers to make a living from their craft. (Sorry for the out-of-focus photo taken hastily from the car window). 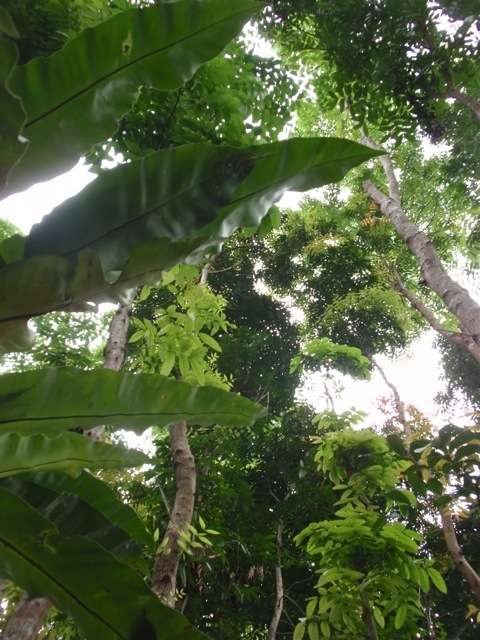 I'd tried to time my visit to the Philippines for the dryest time of the year, but the seasons are now less reliable and there were several downpours during my visit. 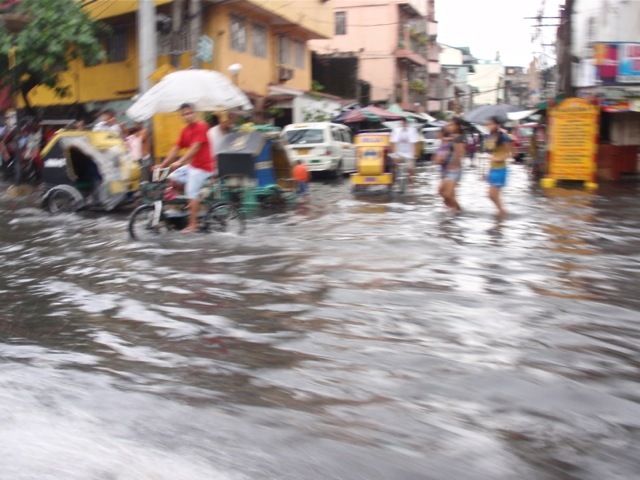 Some of the older areas of Manila, which also have very old drainage systems, are now at or even below sea level as land has been reclaimed from Manila Bay. They're very prone to flash flooding. Sometimes the pleasures come from unexpectedly discovering new places and new experiences. We decided we'd have a brief family holiday at a beach resort. I'm not generally enthused about beach resorts - anywhere in the world. 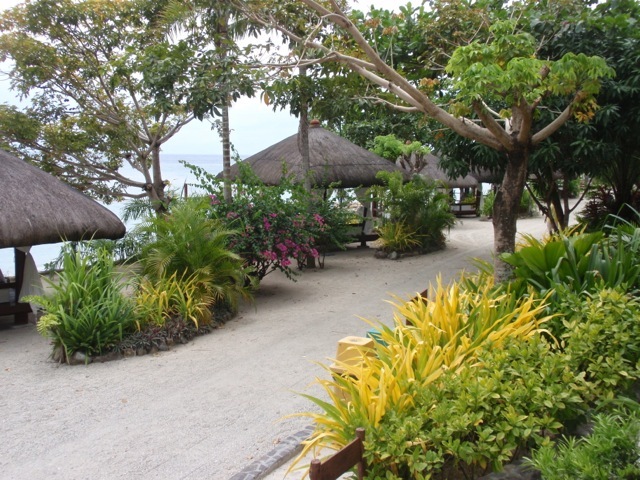 However, our trip to Laiya, Batangas was a great success. Even though the swimmers amongst us reported that the beach was rather too rocky for swimming, a beautifully landscaped swimming pool, plentiful, well-cooked local food, picturesque cabanas along the edge of the sea, and (in my case) a thorough, firm massage, more than compensated for the less than perfect beach. Anyway, if you come from Australia, it's a bit pointless going anywhere else in search of a wonderful beach. 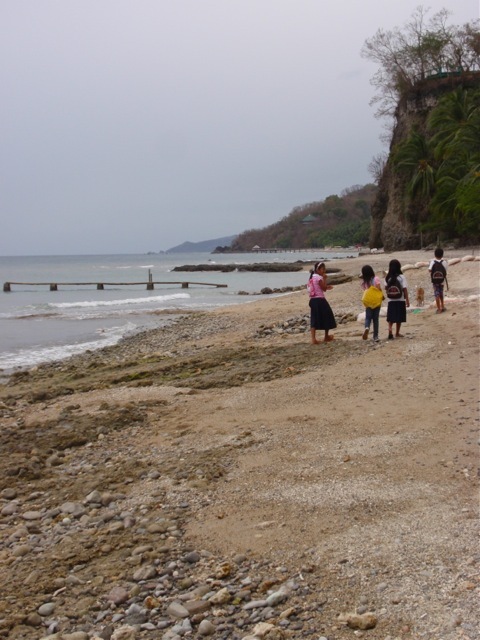 What I particularly liked about the beach was that it is clearly still part of local people's lives. Small fishing boats set out from nearby villages and in the morning and afternoon school children use the beach as the shortest route to and from school and home. Sometimes the pleasures come from remembering things that had slipped from your mind. 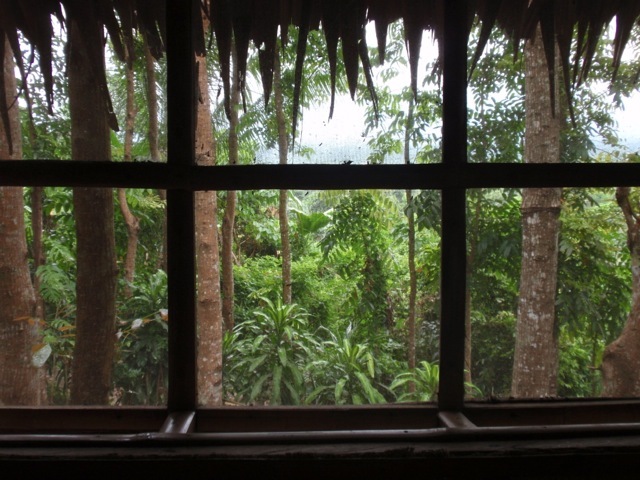 Given that it lasted for almost four centuries, the Philippines bears relatively little trace of its Spanish colonisation. There are the Spanish surnames of most Filipinos; there's some evidence of Spanish influence on the vocabulary of the local languages and, most noticeably, there's the Catholic religion - though even the practice of Catholicism has significant local characteristics. 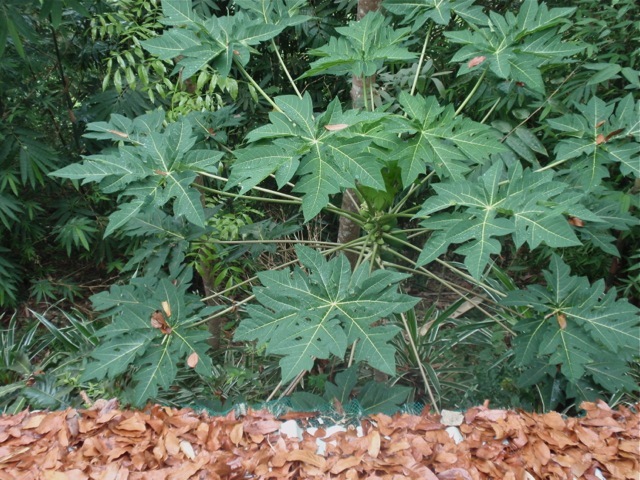 But on my visit this time there were a couple of experiences that reminded me of this Spanish influence. One was simple. We were driving through the town of Nagcarlan, Laguna when we stopped for a brief visit to a Catholic chapel and cemetery that's now maintained by the National Historical Institute. 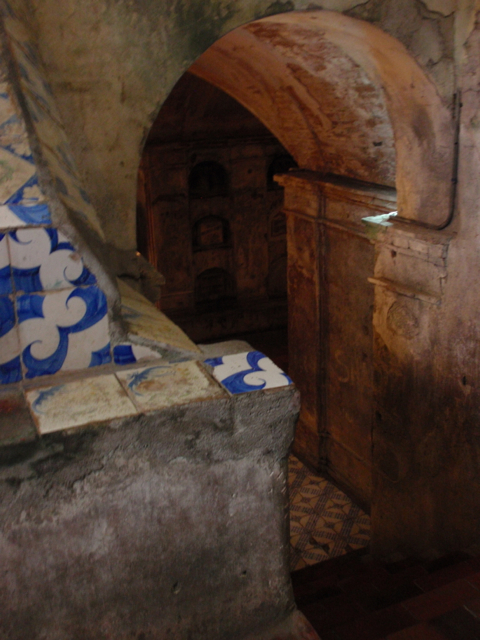 It's interesting partly because of its unusual underground crypt with graves of Franciscan friars, but also because in the 1890s it was used for secret meetings at which the Katipunan rebels plotted the overthrow of the Spanish rulers. 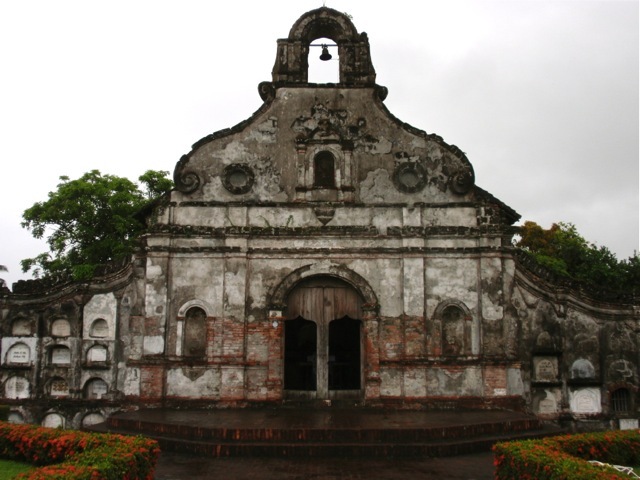 The province of Laguna was a major site both of Spanish dominion and eventually resistance and evidence of their presence is scattered through the towns and villages. A more modern Spanish connection was a performance we saw of the ballet, Giselle, by a group called the Philippine Spanish Dance Connection - primarily a Spanish dance company incorporating many Filipino dancers. It was classical ballet, but with a modern version of the story and brilliant staging using the projection of images to literally give layers to the story. We had some ballet neophytes with us and they were riveted by the updated tale of lovers faithful beyond death. Sometimes the pleasures come from just going about your everyday life. 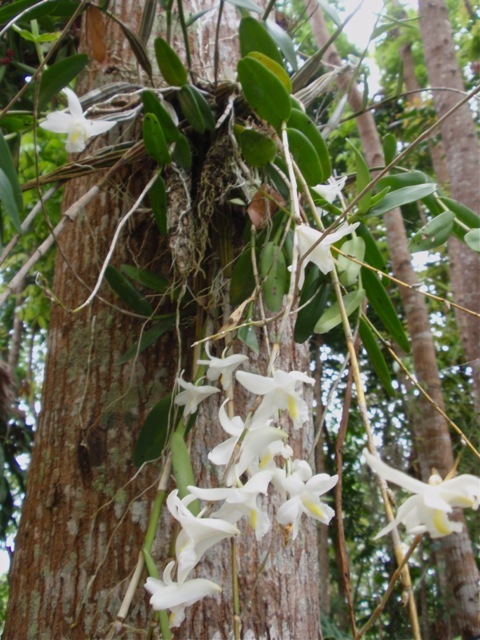 Most simply, we happened to be in Magdalena on the one day when the native orchids bloomed. 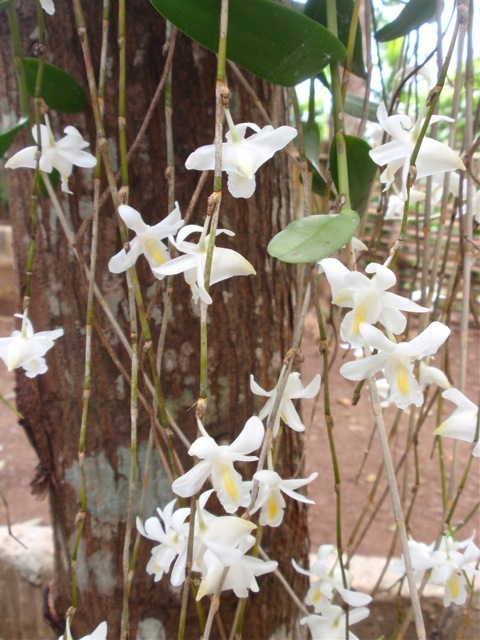 They were in bud one day, bloomed the next, and were all gone by the third day. Or, we were driving home from the local shopping centre when... we saw the dancing traffic cop...in person...in real life! We had front row, or at least front car seats for his performance. There's something so admirably Filipino about this. 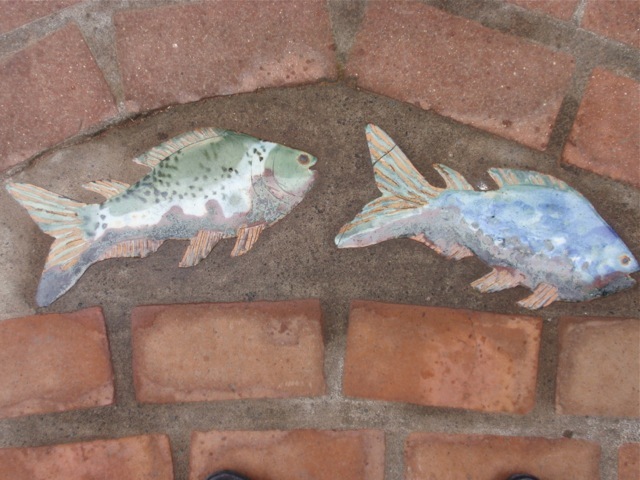 It's about a talent for transforming mundane and tiresome necessities into participatory, and even fun, occurrences. And sometimes the pleasures come just from spending time with family and getting to know a new grandson. I imagine I'll be revisiting, again, soon. Inadvertently, my holiday knitting has been a perfect choice. I decided to knit Heidi Kirramaier's Windward scarf from some mustard coloured Wollmeise yarn I acquired from a friend. 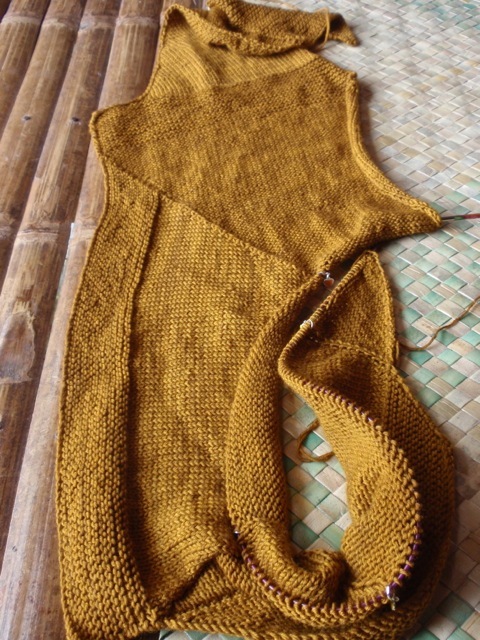 The pattern relies on different textures for its effects - garter stitch, stocking stitch and reverse stocking stitch shapes pieced together asymmetrically. 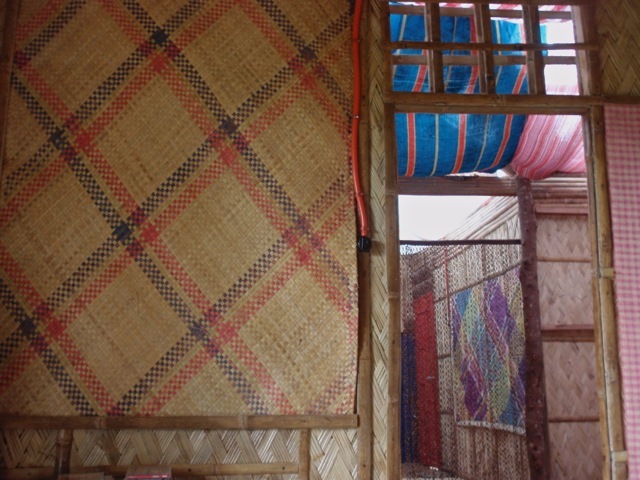 Both the colour and the mixture of textures seemed to echo the mats, floors* and walls of the bahay kubo where I've been staying. Knitting this scarf has the same kind of appeal as knitting a Baby Surprise Jacket. For some time you don't know just how the pieces are going to fit together as you knit at different angles and around corners. It's been an excellent project for travelling. It's had just enough interest to keep me knitting, but it can be stopped and started and knitted in company as needed. Most satisfying. 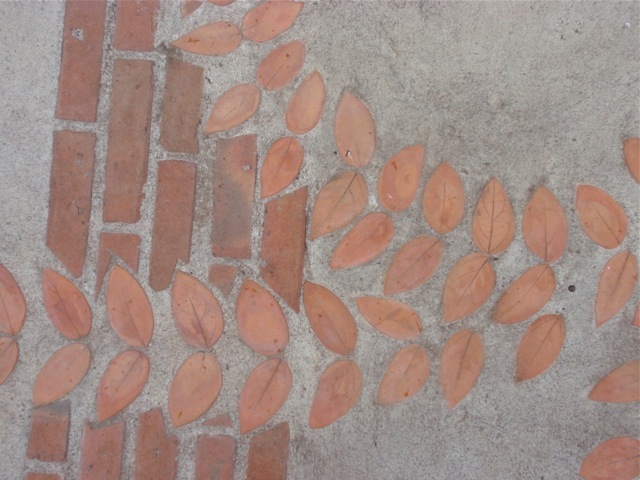 * Yes, Ingrid - to answer your comment on my previous post - the floors do bounce a little as you walk on them. 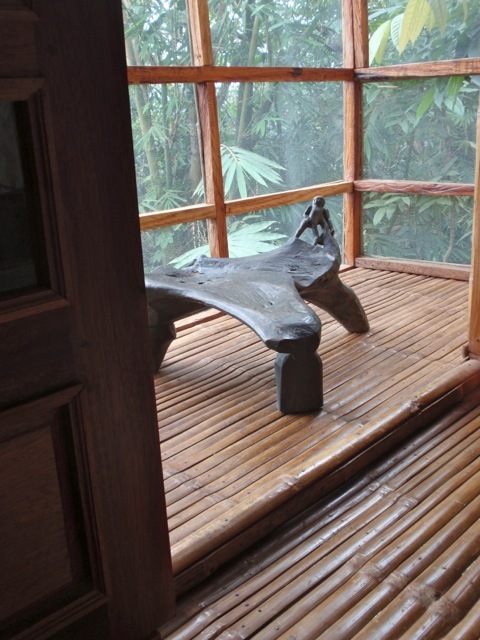 It's one of the things I enjoy; along with the shower water going straight through the gaps in the slatted floor to water the dense vegetation beneath the house. I've been spending time in the Philippines again - visiting family and catching up with my grandson. After a rather rocky, premature start in life, he's flourishing, and very cute. I again spent time outside the bustle, pollution and traffic jams of Manila in Magdalena - about 100ks south of Manila in an area of rice paddies, coconut plantations and densely populated rural towns - though the house in which I stayed is on a steep hillside and gives a very good impression of being in the midst of a tropical forest. I think my design preferences are usually for strong, simple, relatively unadorned lines and forms. 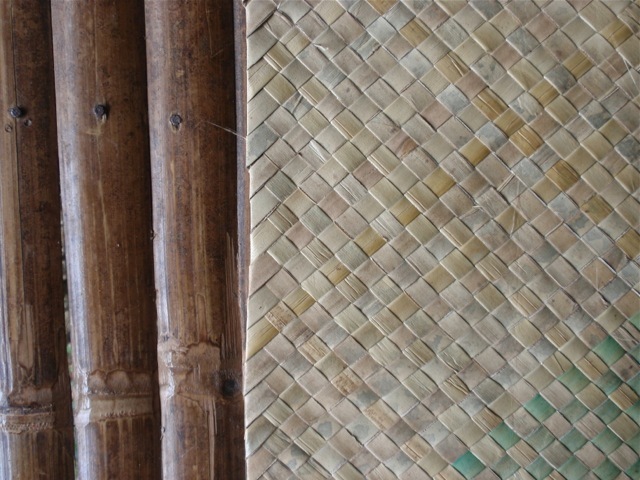 But these busy patterns and textures are so much a part of an honest tradition that their detail and decorative qualities don't seem overdone or too ornate. It's been very pleasurable to observe and take note of them. 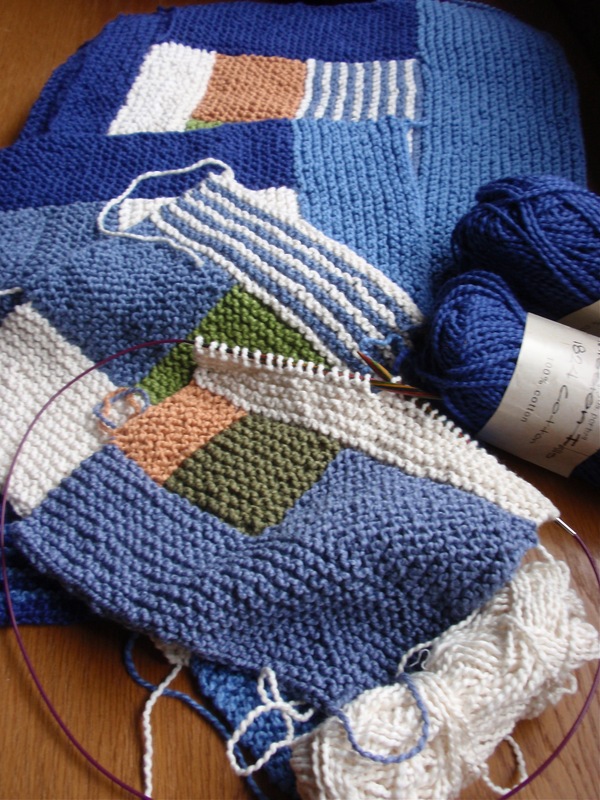 I haven't only been knitting garter stitch squares and triangles - much as I enjoy both of these knitterly geometric pastimes. 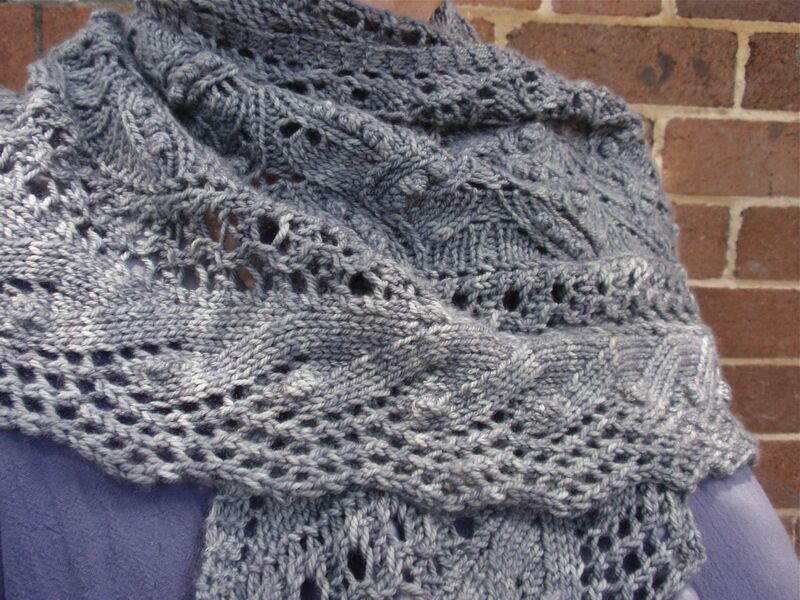 I've knitted a small grey shawl - or more accurately, a triangular scarf. It's yet another Brooklytweed (Jared Flood) pattern. I seem to return time and time again to Brooklyn tweed patterns. I think they combine classic styling with modernity in a way that makes them very wearable. 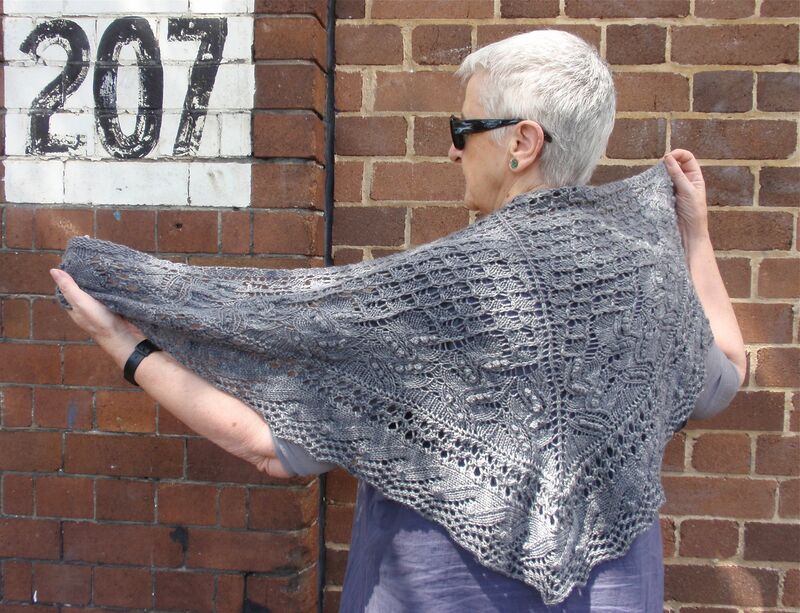 This particular pattern is Juneberry Triangle and was originally designed for a worsted weight 'sticky' yarn. I've knitted it with luxuriously soft Madelinetosh sportweight yarn that has some cashmere and silk mixed into the predominantly wool composition. As a result, the shawl's edges and peaks have not blocked as crisply as the Jared Flood originals, but it makes a softer, more easily draped fabric. Even though this is a triangular scarf, I don't think I would ever describe this as a geometric knit. 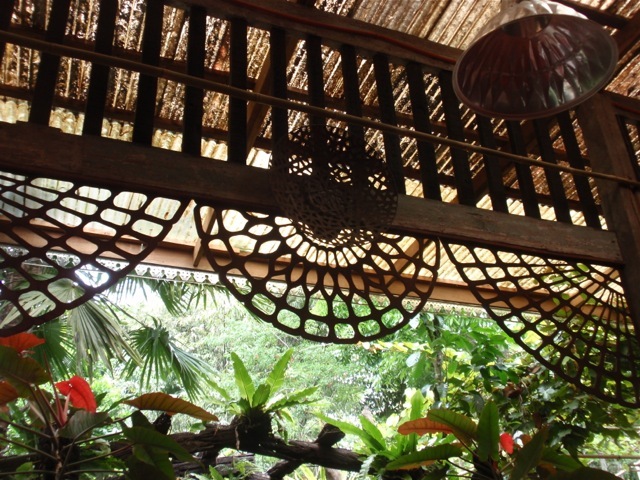 The lace patterns within the shawl are organic and floral rather than geometric, and the two sides of the shawl are not neat - or even approximate - mirror images of one another. It's really quite eccentric in its design. 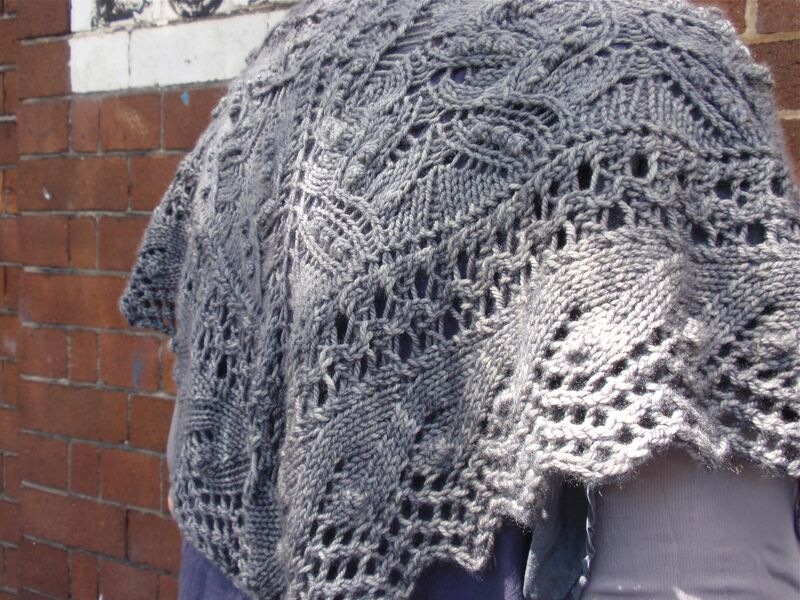 Unexpectedly, I particularly like the bobbles that seem to form blossom patterns in the body of the shawl and that mark each repeat of the edging. 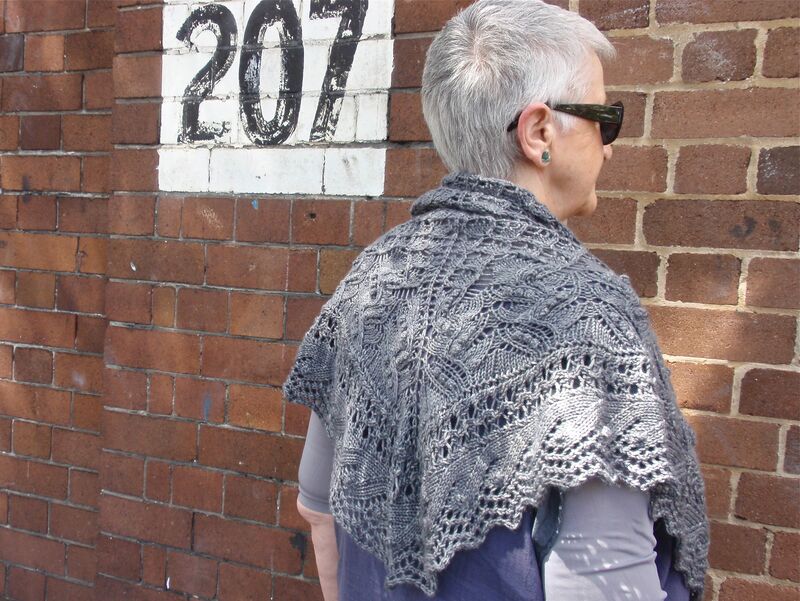 Thanks to a good friend for the photos, taken today as we made our leisurely way to Newtown for a pleasurable Sunday afternoon of knitting. 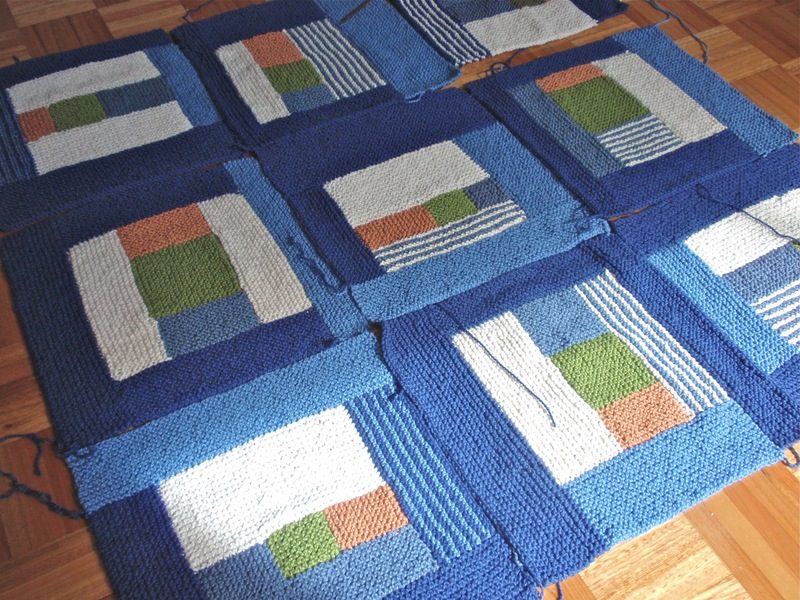 I really have no reason for this blog post other than the fact that - perhaps surprisingly - I'm still enjoying knitting log-cabin (sort of), garter-stitch squares for a blanket. I collected the last of my international parcels of the discontinued Mission Falls 1824 cotton yarn from the post office on Friday, with mental thanks to a generous raveller from the US, and now have more than enough yarn to complete the blanket. The dye lots are a bit variable, and some of the colours don't really match, but I think that's part of the charm of a project like this. I've almost completed nine squares. Each one is about 32cm square. I'm not sure if I will knit 12 squares or 16. 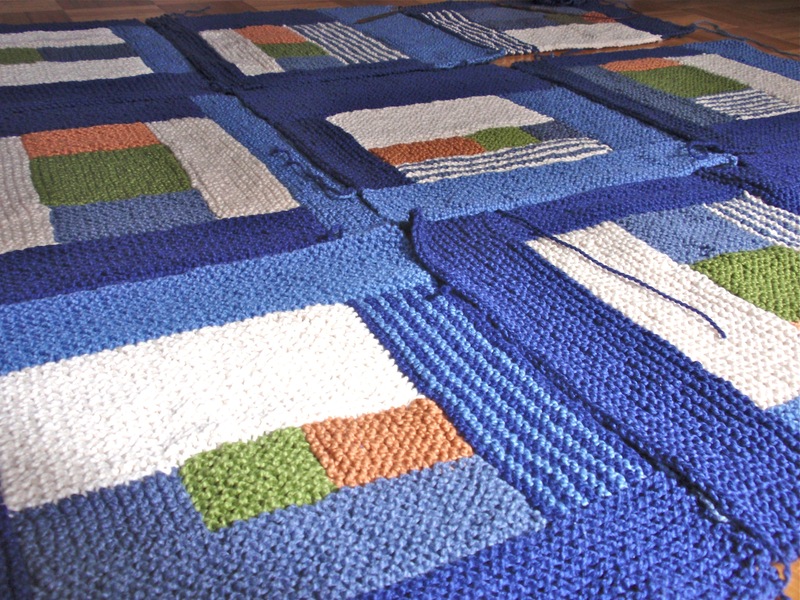 I'd prefer a rectangular shaped blanket to a square one, but 12 may not be sufficiently large and I can't face the thought of knitting 20 squares! I'll see how I feel when I get to 12. Already I'm dreading the sewing together of the squares and the i-cord finish around the edge, but I know the finishing is just so important for a project such as this one. I'm also wondering whether or not to finish it with some backing fabric. I've tried to finish off the log cabin pick-up stitches and yarn joins as neatly as possible, but even so the reverse of the blanket has a distinctly 'wrong side' appearance. Again, I'll decide just what to do when I get to that stage. But, for the moment, I'm still enjoying the garter stitch geometry of the log cabin squares - and it has the advantage of being an excellent social knitting project as there's no danger whatsoever of making errors while chatting.